B Martin, I J Pulai, S Manickam, S K Kankam, J Montgomery, A M Begley, P Visintainer, A B Knee, A Samodumov. Ultrasound Evaluation of The Costophrenic Recess as a Marker of Phrenic Nerve Function. The Internet Journal of Anesthesiology. 2018 Volume 37 Number 1. Background: An interscalene brachial plexus (ISB) nerve block is a commonly utilized modality for shoulder analgesia. However, a side effect of this approach is phrenic nerve blockade which may preclude patients with impaired pulmonary function from the benefit of this nerve block. Previous studies have demonstrated that lower doses of local anesthetics, ultrasound guidance, and a lower cervical approach when performing the block have resulted in a decreased incidence of phrenic nerve blockade. Despite all of this, the side effect of phrenic nerve blockade and pulmonary complications may still occur and there is not a well-established and rapid modality for anesthesia providers to assess for phrenic nerve blockade after completing an ISB. The objective of this study is to determine if the movement of the most caudal lung tissue into the costophrenic recess can be used as a marker of normal diaphragmatic function, aiding in the diagnosis of peri-operative respiratory complications. Methods: A prospective, observational pilot study evaluating twenty patients who had an interscalene nerve block prior to arthroscopic shoulder surgery was performed. We included adult patients (age 18 or older) with ASA classification I-III. We excluded patients with chronic pain, neurologic deficits in the upper extremity, severe COPD (home oxygen therapy), allergy to local anesthetics, contralateral diaphragmatic paralysis, and/or allergy to bupivacaine, lidocaine, chlorhexidine or propofol. Pre block and post block ultrasound scanning of lung tissue was performed to determine the presence or absence of lung tissue in the costophrenic recess, with absence being a marker of phrenic nerve blockade causing paralysis of the ipsilateral diaphragm. A descriptive analysis was performed. Results: All 20 patients had successful interscalene nerve block and endorsed thumb paresthesia after the block. All patients in the study also had lung tissue present in the costophrenic recess during the pre and post block ultrasounds suggesting no phrenic nerve involvement. None of the patients experienced respiratory complications immediately after the interscalene block, in the post anesthesia care unit, or within 24 hours post-op. The pre and post block scans were all performed in less than three minutes. Conclusions: Our study demonstrates that ultrasound scanning of the costophrenic recess is a potential novel, feasible and rapid technique for assessing phrenic nerve function after a low cervical approach interscalene nerve block. Analgesia for shoulder surgery may be achieved with an interscalene brachial plexus nerve block. Ultrasound imaging has been used to enhance the quality and speed of the peripheral nerve blocks.1 Phrenic nerve blockade is a well-described side effect of an interscalene nerve block (ISB) and may preclude patients with impaired pulmonary function from its analgesic benefit. An ISB is generally performed with local anesthetic volumes of 20 ml or greater.2,3 Several dose evaluation studies for individual blocks have demonstrated that the minimum local anesthetic dose required with ultrasound guided regional anesthesia is lower than traditional doses.4 Recent studies have also demonstrated decreased incidence of phrenic nerve blockade and unilateral diaphragmatic paralysis to just over 10% with lower doses of local anesthetic.2,3 Phrenic nerve blockade can theoretically also be minimized by adopting a lower cervical approach.3 This approach differs from the classic approach of the interscalene block. In the classic approach, the cricoid cartilage is used as a landmark and via ultrasound imaging; a “traffic light” formation of the cervical nerve roots can be visualized. With the lower cervical approach, the anatomical landmark is above the midpoint of the clavicle in the interscalene groove and the brachial plexus will be more compact and at the level of the trunks or divisions. In this study, phrenic nerve function will be assessed by ultrasound, a noninvasive technique that has proved to be an accurate, safe and easy to use bedside modality.5,6 Ultrasound can be used to visualize lung tissue sliding into the costophrenic recess upon deep inspiration. The pleura extends beyond the inferior border of the lung but not as far as the attachment of the diaphragm. The costophrenic recess is a potential space in the pleural cavity located at the junction of the costal pleura and diaphragmatic pleura that extends from the eighth to the tenth rib along the mid-axillary line where the diaphragm meets the ribs. The pleural recess allows the proportionate inspiratory expansion of the lungs, and the lungs expand into this recess during forced inspiration.8 The objective of this study is to investigate if the movement of the most caudal lung tissue into these recesses can be used as a marker of normal diaphragmatic function. It is our hope that the clinician can easily utilize ultrasound scanning of the costophrenic recess to assess the presence of phrenic nerve blockade after an ISB. This was an IRB approved case series of twenty patients to assess phrenic nerve blockade by ultrasound scanning of lung tissue in the costophrenic recess. Written informed patient consent was obtained from all study participants. We chose 20 subjects to demonstrate feasibility. We included adult patients with ASA I-III classification, age 18 or older, scheduled for shoulder surgery at a single hospital outpatient ambulatory surgery facility from October 2017 – January 2018. We excluded subjects with chronic pain (patients consuming opioids for more than three months), neurologic deficits in the surgical upper extremity, severe COPD requiring home oxygen therapy, allergy to local anesthetics (lidocaine, bupivacaine), contralateral diaphragmatic paralysis, and/or allergy to chlorhexidine or propofol. The same anesthesiologist performed all scans and nerve blocks. We assessed lung movement into the ipsilateral costophrenic recess, using a standard linear (8-14 MHz) ultrasound probe. The transducer was positioned in a vertical (caudal to cephalad) orientation, at approximately the mid-axillary line, overlying the most caudal intercostal spaces. While sitting on a bed semi-reclined at 45 degrees, all patients were asked to perform maximal deep breathing, during the costophrenic recess scan. Each patient had three separate scans. The first was the pre-block scan of the costophrenic recess, the second was during the nerve block, and the third was the post-block scan of the costophrenic recess, approximately 20-30 minutes after the block. The anesthesiologist performed subcutaneous infiltration with 2% lidocaine (all patients received 2 ml for subcutaneous infiltration) via a 25-gauge needle, after cleansing the injection site with chlorhexidine. The anesthesiologist performed a low cervical approach ISB using a 22-gauge nerve block needle attached to a single syringe filled with 0.25% bupivacaine (with epinephrine 1:200,000). Block start and end times were recorded. We assessed the success of the block by examining the subject’s thumb for paresthesia approximately 20 minutes from the end of the nerve block. If the block was not successful at 20 minutes, per protocol, the patient was to be discontinued from the study. After a successful block, the patient was taken to the operating room. General anesthesia was administered to all the patients for surgery. The patients were then assessed in the post anesthesia care unit for respiratory symptoms and pain scores. We did not standardize the intraoperative anesthetic. All patients were called via telephone on postoperative day 1 to assess block duration, pain level, and respiratory symptoms. The primary outcome of the study, which was defined and established at initiation of the study, was the presence or absence of lung tissue in the costophrenic recess after an interscalene nerve block. The absence of lung tissue in the costophrenic recess was used as a marker of phrenic nerve blockade resulting in paralysis of the ipsilateral diaphragm. We also investigated the feasibility of this modality by assessing if lung tissue could be visualized with a bedside ultrasound and the amount of time required to perform costophrenic recess scanning and the interscalene nerve block. Secondary endpoints included block success, time required for ultrasound scans and the nerve block, patient respiratory symptoms, pain scores and block duration. As this was pilot study, no hypothesis testing was planned. Data analyses were limited to descriptive statistics (means, standard deviations (SD), median, range, frequencies and percentages). We did not adjust for confounders because the analysis was descriptive and a demonstration of feasibility. This manuscript adheres to the applicable STROBE guidelines. (Table 1). 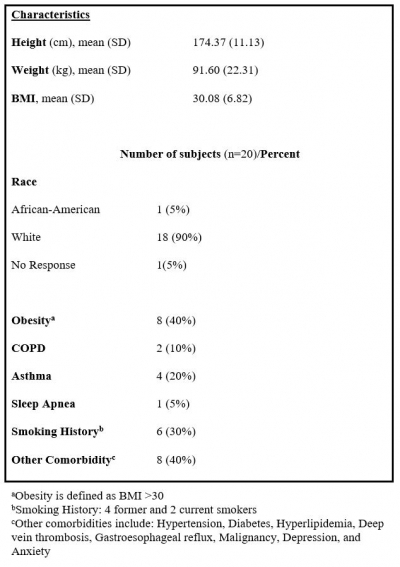 In terms of comorbid conditions, four patients had asthma, two patients had COPD, eight patients were obese, one had obstructive sleep apnea and six had a history of smoking (four former smokers and two current). In regards to feasibility measures, preblock costophrenic recess scans were performed in two minutes or less in all patients (in 18 out of 20 patients the scan was performed in under one minute). The anesthesiologist performed a low cervical approach ISB on each of the subjects preoperatively (Figure 1). All of the ISBs took five minutes or less to perform with 90% (18 out of 20) taking less than three minutes. All post block scans to assess for phrenic nerve involvement were done within 28 minutes after the block was completed and took less than three minutes to perform. Seventeen out of 20 patients received 10 ml of bupivacaine (with epinephrine 1:200,000) for their block. Three patients had received 11, 12, and 18 ml bupivacaine (with epinephrine 1:200,000) respectively. All of the patients had a successful ISB and endorsed thumb paresthesia after the block. In addition, 100% of the patients in the study had lung tissue present in the costophrenic recess during the pre and post block ultrasounds, which suggests no phrenic nerve involvement. 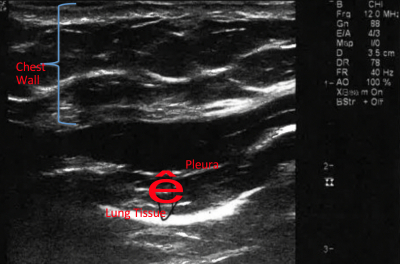 Pre and post block scans were performed using the transducer positioned in a vertical orientation, at approximately the mid-axillary line as shown in Figure 2. Figure 3 is an example of a post ISB costophrenic recess ultrasound image that shows lung tissue present in the recess. All 20 patients were able to perform deep breathing before and after the ISB. None of the patients experienced respiratory complications immediately after the ISB, in the post anesthesia care unit (PACU), or the first 24 hours after surgery. 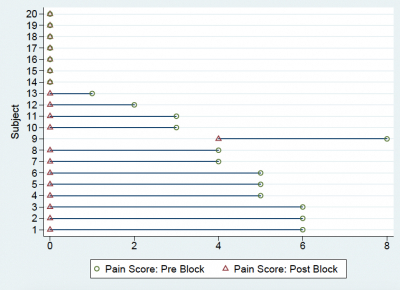 The median pre-block pain score was 3/10 with a range of 0-8. After the block, 19 patients had a pain score of 0 out of 10 and one patient had 4 out of 10 pain (Figure 4). During the phone call on postoperative day one, patients were also assessed for the duration of their ISB effects. The median length of time from the end of the block procedure to the cessation of numbness was 16 hours with a range of 5.6 hours to 23.4 hours. Phrenic nerve blockade occurs commonly after ISB and can result in significant morbidity.3 Our study demonstrates that ultrasound scanning of the costophrenic recess is a quick, simple, and safe technique to assess for phrenic nerve blockade by identifying the presence or absence of lung tissue. The fact that none of our study subjects had phrenic nerve blockade after their ISB supports two important concepts that were previously studied. The first is that decreasing the volume of local anesthetic should decrease the incidence of phrenic nerve blockade due to lack of spread to the phrenic nerve.2,3 The second refers to performing the ISB at a more caudal neck position than traditionally taught, which may likewise decrease the spread of local anesthetic to the phrenic nerve.4 If we can minimize or even eliminate phrenic nerve blockade as a side effect, we may be able to safely perform ISBs in patients with respiratory compromise or those with conditions that may have precluded them from getting an ISB in the past, such as obstructive sleep apnea, chronic obstructive pulmonary disease, or obesity. This technique of scanning of the costophrenic recess may be a reliable and feasible way of assessing phrenic nerve function without compromising procedural efficiency. Another useful application of costophrenic recess scanning may be in the assessment of respiratory symptomatology. In patients who develop postoperative respiratory complications such as dyspnea or hypoxia, costophrenic recess scanning may potentially be utilized to rule out phrenic nerve blockade after an interscalene nerve block as a potential cause. Although the sample size is small, this study also suggests that patients with increased BMI can be assessed via scanning of costophrenic recess. We were also able to utilize a standard 8-14 MHZ linear probe, avoiding the necessity of switching to a curvilinear probe or having to reduce the frequency for deeper structures as suggested by some authors.7 Prospective randomized trials with larger sample sizes will have to be designed to provider stronger evidence that costophrenic recess scanning can serve as a reliable imaging modality to assess phrenic nerve function across a variety of patient characteristics. Another limitation of the study is the lack of patients with respiratory disease to properly assess the application of costophrenic recess scanning to this subset of patients. A future design may entail a much larger sample size, allowing a subgroup analysis of these patients. Also, we did not standardize the anesthetic during the operating room or in the recovery unit. Our study demonstrates that ultrasound scanning of the costophrenic recess is a potentially novel and rapid technique for assessing phrenic nerve function after an interscalene nerve block. Interescalenic block: The needle tip is seen in contact with the elements of the brachial plexus. This image depicts the distribution of local anesthetic between and alongside roots of the brachial plexus during an interscalene block. As opposed to the “traffic light” formation of the cervical nerve roots typically seen during the conventional approach to the block, with a lower cervical approach the brachial plexus has split into trunks and the nerves are more compact. MS- Middle Scalene, BP- Brachial Plexus, SCM- Sternocleidomastoid Muscle, AS-Anterior Scalene, Red Arrow pointing to needle tip. 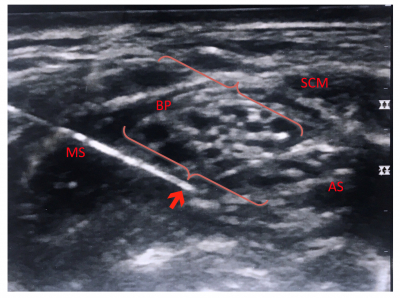 Probe placement: To access phrenic nerve function before and after an interscalene block, the ultrasound transducer was positioned in a vertical (caudal to cephalad) orientation, at approximately the mid-axillary line, overlying the most caudal intercostal spaces as shown above. Lung tissue: Ultrasound image of lung tissue within the costophrenic recess 20 minutes after interscalene block. Lung tissue can be seen here in the costophrenic recess. This is a marker of normal phrenic nerve function. Equator checklist: Each subject was asked to quantify his or her level of pain on a scale of 0-10 prior to and after the performance of the interscalene block. 1. Liu SS, Ngeow J, John RS. Evidence basis for ultrasound-guided block characteristics: onset, quality, and duration. Reg Anesth Pain Med. 2010;35:S26–35. 2. Lee JH, Cho SH, Kim SH, et al. Ropivacaine for ultrasound-guided interscalene block: 5 mL provides similar analgesia but less phrenic nerve paralysis than 10 mL. Can J Anaesth. 2011;58:1001–1006. 3. Verelst P, van Zundert A. Respiratory impact of analgesic strategies for shoulder surgery. Reg Anesth Pain Med. 2013;38:50–53. 4. McNaught A, Shastri U, Carmichael N, et al. Ultrasound reduces the minimum effective local anaesthetic volume compared with peripheral nerve stimulation for interscalene block. Br J Anaesth. 2011;106:124–130. 5. Boussuges A, Gole Y, Blanc P. Diaphragmatic motion studied by M-mode ultrasonography. Chest. 2009;135:391–400. 6. Matamis D, Soilemezi E, Tsagourias M, et al. Sonographic evaluation of the diaphragm in critically ill patients. Technique and clinical applications. Intensive Care Med. 2013; 39: 801–810. doi:10.1007/s00134-013-2823-1. 7. Zanforlin A, Giannuzzi R, Nardini S, et al. The role of chest ultrasonography in the management: document 1. Multidiscip Respir Med. 2013; 8:54. 8. Standring S. Pleura, lungs, trachea, and bronchi. In: Gray’s Anatomy: The Anatomical Basis of Clinical Practice. 41st ed. Philadelphia, PA: Elsevier Limited; 2016:953-969.